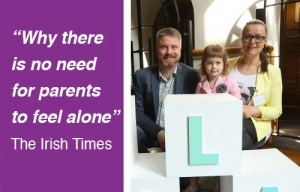 The Lifestart Foundation is an all-Ireland charitable body offering a high quality, evidence-based programme for parents of children from birth up to age five years. Our core programme – the Growing Child – is delivered within the family home on a monthly basis. The programme has been proven to reduce parental stress; strengthen the relationship between parent and child; and support parents in their understanding of how a young child develops and learns. We work with parents so they can support their child to grow and develop in areas of speech and language, problem solving, better self-esteem, and of course, in preparing the child for their later successes in school. What is the Lifestart Programme? The Lifestart Growing Child programme** for parents is a structured month-by-month curriculum of information, knowledge and practical learning activity for parents of young children. The programme offers age-specific information on child development and is tailored to suit each individual child and family. The programme is delivered by specially trained family visitors in the parent’s own home – the best environment for early learning and development. We know through research that the early life experiences creates the foundation for a child’s physical, social and emotional health, and later learning. We also know that at this unique time, children gain the competence and coping skills that will affect their future. By offering parents detailed information on how a child grows and learns, the Lifestart Growing Child programme helps them to support their infant’s physical, intellectual, emotional and social development, in a fun and enjoyable way. ** Authors who have contributed to the Growing Child are: Phil Bach, O.D., Ph.D., Miriam Bender, Ph.D., Joseph Braga, Ph.D., Laurie Braga, Ph.D., George Early, Ph.D., Carol R. Gestwicki, M.S., Liam Grimley, Ph.D., Robert Hannemann, M.D., F.A.A.P., Sylvia Kottler, M.S., Bill Peterson, Ph.D.